The murder of two French police officials by a man claiming allegiance to so-called Islamic State (IS) is "unquestionably a terrorist act", President Francois Hollande says. A police commander and his partner were stabbed to death at their home west of Paris. Their three-year-old survived. The attacker was killed in an police assault on the house. He had spent time in jail over jihadist links and had a list of targets including public figures, police say. Named by French sources as Larossi Abballa, he had also been under recent police surveillance, including a wiretap, say media reports quoting police sources. Media captionPresident Hollande: "Unquestionably a terrorist act"
Paris Prosecutor Francois Molin said that Abballa had pledged his loyalty to IS leader Abu Bakr al-Baghdadi during negotiations prior to the police assault on Monday, and had stated that he was answering his call "to kill infidels". Three people linked to the man were arrested and placed in custody, he said. Police say the man lay in wait outside the policeman's house on Monday evening before the ambush took place at around 20:30 (18:30 GMT). After the murder he went inside the house and killed the policeman's wife, and held their three-year-old son hostage. Abballa, 25, was shot and killed when police entered the couple's home in Magnanville at about midnight, hours after he posted a 13-minute video on Facebook Live in which he swore allegiance to IS. In the video, he was shown considering what to do with their son, according to French jihad expert David Thomson, who watched it. Image caption According to David Thomson, at one point during the Facebook Live video: "The baby is behind him, on the sofa. After killing his parents he says: 'I don't know yet what I'm going to do with him'"
"I don't know yet what I'm going to do with him," the killer is heard saying. In the video, he also made a threatening reference to the Euro 2016 football tournament. Two Facebook accounts linked to Abballa were suspended on Tuesday morning. Police also discovered a list of six people who the suspect wished to target on his computer, reported iTELE - including two public personalities. Mr Molins said the list included "rappers, journalists, police and public figures". Abballa lived in nearby Mantes-La-Jolie and was convicted in 2013 of "criminal association with the aim of preparing terrorist acts". He was sentenced to a three-year term in prison, of which six months were suspended, for recruiting fighters for jihad in Pakistan. The IS-linked Amaq news agency claimed an IS "fighter" had carried out the attack. France has been under a state of emergency since the Paris attacks of 13 November 2015 in which 130 people died. That state of emergency is still in place with France on high alert as it hosts the Euro championship, which started last Friday. Le Parisien reports that the 42-year-old policeman, named as Jean-Baptiste S, was deputy chief of judicial police at Les Mureaux police station, near their home. It says (in French) he was previously stationed at the police station of Mantes-la-Jolie, where Abballa lived. President Hollande said he and his 36-year-old partner, Jessica S, were "murdered in cowardly fashion". "It's unquestionably a terrorist act," Mr Hollande said, stressing that France was still "facing a very significant terrorist threat". Earlier, Interior Minister Bernard Cazeneuve said more than 100 people seen as potential threats had been arrested in France this year, including in recent weeks. French prosecutors have launched an anti-terror investigation into the incident. Witnesses say that the knife-wielding man may have shouted "Allahu akbar" (God is great) when he ambushed the policeman, who was not in uniform, outside his home. The attacker then barricaded himself inside the house, where the police officer's partner and child were present. 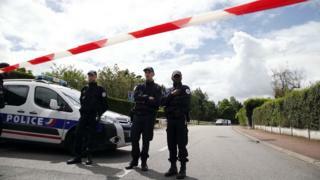 Interior ministry spokesman Pierre-Henry Brandet said France's elite police Raid unit was brought in at about 21:00. Mr Brandet said negotiations were unsuccessful and a decision was made to "launch an assault" at about midnight. Witnesses reported hearing loud explosions as the officers from the Raid unit moved in. "This commander, this police officer was killed by the individual... [and] we discovered the body of a woman," Mr Brandet told reporters. "The assailant, the criminal was killed. Thankfully, a little boy was saved. He is safe and sound." Magnanville is about 55km (35 miles) north-west of the French capital. Who was French police killer Larossi Abballa?